From 27-30 September, the 25th ENCATC Congress on Cultural Management and Policy gathered together in Brussels more than 200 academics, researchers, professionals and representatives from various EU institutions, governments and European and international networks to discuss the key role of networks and develop ideas and proposals to guarantee their sustainability in a challenging environment. The 25th ENCATC Congress “Click, Connect and Collaborate! 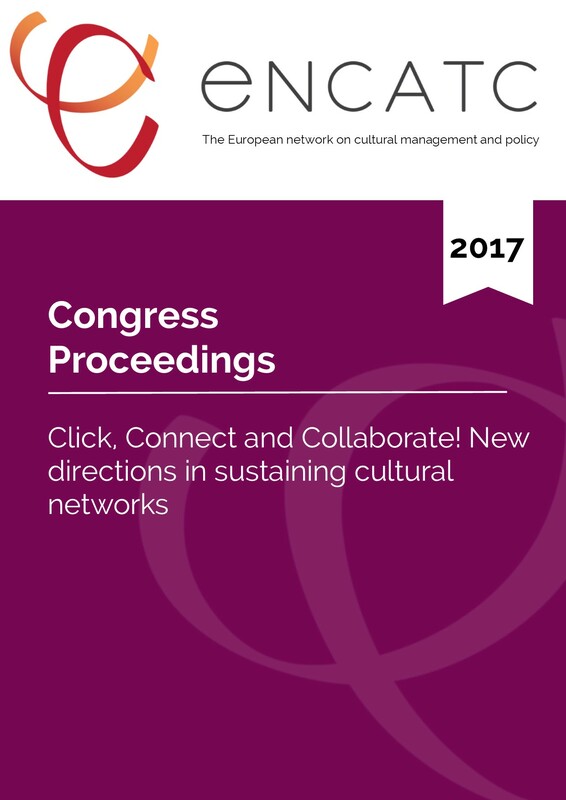 New directions in sustaining cultural networks” took place in Brussels, Belgium from 27-30 September 2017. This major international event brought together more than 230 participants who were academics, researchers, professionals from the cultural sector, policy makers, artists, students and media from 40 countries. For the first time in 2017, to mark the network’s 25th anniversary and the next chapter in its evolution, the Congress encompassed a new enlarged format that included the 10th Young and Emerging Researchers’ Forum, the 2nd Annual Members’ Forum, the 25th Annual ENCATC Congress, 7th ENCATC Policy Debate, the 8th Annual ENCATC Research Session, and the 4th ENCATC Research Award Ceremony. This was a significant development for the network, its members and followers who increasingly represent a more international audience. The new format ensured interesting content for a diverse audience and rich exchange and cross-pollination between education, research, training, and practice. 25th ENCATC Congress kick-offed on 27 September at the Bip, house of the capital region. The morning began with the 10th Young and Emerging Researchers’ Forum. The 2017 edition was designed for young and emerging cultural policy researchers to help them advance in their careers and enlarge their networks in Europe and beyond. Participants exchanged research trends, addressed topical research issues, methodology, professional cooperation, publishing opportunities, online knowledge exchange and collaboration. In addition, this year’s YERF particularly encouraged dialogue on cultural management and cultural policy/governance studies, and with a focus on Asia and Europe regions. That same afternoon, the 2nd Annual Members’ Forum gathered ENCATC members as well as members of the networks the Association of Arts Administration Educators (AAAE) and the Taiwan Association of Cultural Policy Studies (TACPS). This plenary session started with an exchange on cultural management and policy education from a global perspective with representatives coming from across Europe, the Americas, Africa, and Asia. The Members’ Forum was also the opportunity to learn about new curricula, pedagogy, methodologies and policies with presentations prepared by members for their peers. On 28 September, the Congress opened to all delegates. After the official welcome, the programme began with a plenary session panel debate on the “Evolution and impact of the cultural management and policy network on the cultural sector in terms of its professionalisation: past, present, and future”. ENCATC’s past and current Presidents coming from higher education institutions in Belgium, France, Germany, and Spain were joined by GiannaLia Cogliandro Beyens (current Secretary General) who shared their reflections about the impact and importance of ENCATC during the organisation’s 25 years of existence. Next, our keynote, Milena Dragićević-Šešić, Head of UNESCO Chair in Interculturalism, Art Management and Mediation, Belgrade University of Arts in Belgrade, Serbia was invited to take the floor. She delivered a passionate speech on “Networking culture - The role of European cultural networks” and shared her expertise, creative and innovative insight providing alternative and thought-provoking ways of exploring the sustainability of cultural networks. After the day’s networking lunch, the 2nd Global Conversations, organised in partnership with AAAE and TAPCS, offered delegates a space to debate about the Brussels manifesto, a draft document that defines a common set of guiding principles and aspirations for the arts and cultural management education field. The draft document is an outgrowth of the Dialogue of Networks, a session that took place at the 2017 AAAE conference in Edinburgh, Scotland where more than 15 networks engaged in a process to identify the key ideas in the Manifesto. Now, at this year's ENCATC congress, discussions brought new perspectives and deeper reflection to refine the document even further before it is presented externally in the coming months. Continuing in the afternoon, participants separated into four parallel discussion groups to advance the state of art and promote new ideas and proposals on the major challenges faced by cultural networks today in Europe and beyond: Governance/Leadership; Business Models; Evaluation; and the Internationalisation of Networks. The evening programming was dedicated to the 4th ENCATC Research Award where Dr. Rebecca Amsellem from France was announced as the 2017 winner for her PhD thesis “The international strategies of museums and their new business models” defended at University Paris 1 Panthéon Sorbonne. The next day, the programme started with the 8th Annual ENCATC Research Sessions and Thematic Sessions. More than 41 papers were presented by academics, researchers and practitioners from 24 countries. They shared the latest research developments and trends in the wide field of cultural management and policy covering cultural heritage, evaluation, culture and sustainable development, cultural policy, creative industries, cultural diplomacy, performing arts, cultural leadership, just to name a few. This resulted in a published book of proceedings available for download online. After lunch, a plenary session on “The Compendium of Cultural Policies and Trends in Europe: strategies for a new multi-stakeholder network" presented an analysis of global developments that influence cultural policies. It also explored future-proof scenarios for the Compendium research community and its database. Next, the “Citizens’ Dialogue and the European Year of Cultural Heritage” was led by representatives from the European Commission’s DG for Education and Culture and DG Communication. They shared how it is possible to host one of the 2018 Citizens' Dialogues. There was a lively Q&A session on the challenges to foster dialogue between citizens and policy makers, especially the difficulties to reach marginalised populations. To bring Congress delegates into the discussion on the 2018 European Year of Cultural Heritage (EYCH), the next plenary session focused on “EU Policy Development on Cultural Heritage”. Representatives from the European Commission were joined by heritage experts and researchers to discuss the state of art of heritage policies in Europe, trends on training programmes on Intangible Heritage, collaboration and participation in cultural heritage management, and what’s next to prepare for the EYCH 2018. The day ended with a party to celebrate ENCATC’s 25th Anniversary. Organised at BOZAR, Centre for Fine Arts, the evening was a time to share stories, look back on what has been accomplished, and how together ENCATC members and Congress delegates will be part of its future. The last day of the Congress on 30 September had a study visit dedicated to discovering Brussels’ the European House of History. After a visit, participants met with the museum’s curator to discuss practical management issues, questions of the pedagogical digital materials, and reactions to the purpose and design of the exhibition space. In a final get-together moment, everyone was invited to enjoy traditional Belgian fries at Maison Antoine, one of the most recognised “friterie” in the city. There is no doubt this major international gathering was a success for collecting new ideas, sharing knowledge and different perspectives, and delivering recommendations. We were witness to the many networking moments and synergies initiated by our active members and Congress delegates!